What have the Humanities and Liberal Arts to do with design? How can contemporary design be made more human-centered? A key component of the history of the Humanities and Liberal Arts has been our relationships with the world of things, of making and consuming goods. A key component of contemporary design is a human-centered perspective that puts experience in all its human richness before physical product. 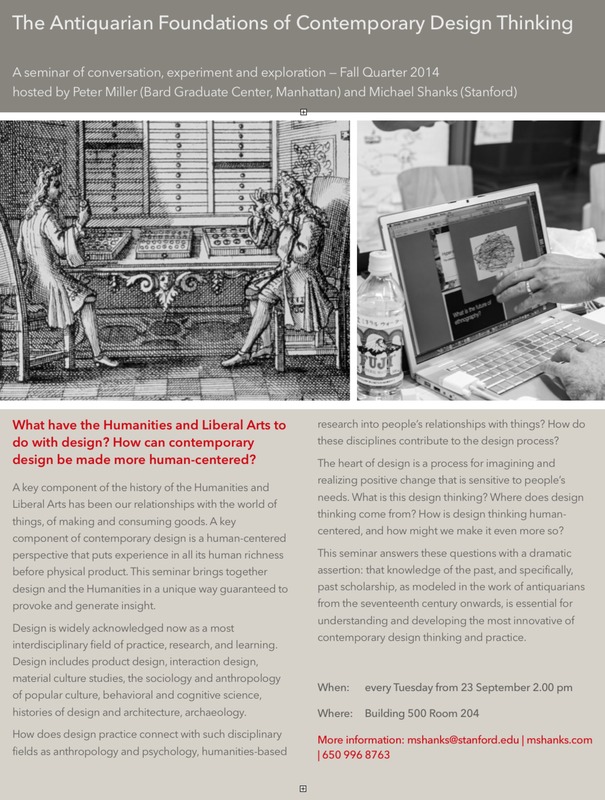 This seminar brings together design and the Humanities in a unique way guaranteed to provoke and generate insight, to prompt a wider reaching Liberal Arts and more human-centered design. Our proposition is that the current enthusiasm for design-based approaches to everything from consumer products to social innovation is deeply rooted in centuries old traditions in the Humanities and Liberal Arts. Human-centered design thinking is not a flash-in-the-pan business fad, but part of a tried and tested practical orientation on the world that we can see at work in the experimental science of early modern antiquarians. Design is widely acknowledged now as a most interdisciplinary field of practice, research, and learning. Design includes product design, interaction design, material culture studies, the sociology and anthropology of popular culture, behavioral and cognitive science, histories of design and architecture, archaeology. How does design practice connect with such disciplinary fields as anthropology and psychology, humanities-based research into people’s relationships with things? How do these disciplines contribute to the design process? From industrial design to contemporary human-centered design, at the heart of design is a process for imagining and realizing positive change that is sensitive to people’s needs. What is this design thinking? Where does design thinking come from? How is design thinking human-centered, and how might we make it even more so? This seminar answers these questions with a dramatic assertion: that knowledge of the past, and specifically, past scholarship, as modeled in the work of antiquarians from the seventeenth century onwards, is essential for understanding and developing the most innovative of contemporary design thinking and practice. The antiquarians of early modern Europe studied the physical remains of past civilizations, conducting fieldwork and collecting artifacts, describing them in letters to colleagues and through the illustrated book, and comparing what they found in the ground with what they found in texts. Close looking and engagement led to an intense material knowledge of places and objects. Antiquarian fieldwork and research was a paradigm of experimental scientific method. Antiquarians mobilized the past in the service of the present, communicated their findings and preserved their objects for posterity. Over the last fifty years we have seen a shift from industrial design, concerned particularly with the styling of goods produced for a mass market, to the design of experiences, where goods are much more than the way they look and the functions they perform, when they offer experiences in everyday life and beyond, when they are always part of cultural ecologies. Design is human-centered when it holds that account has to be taken of the entire context of people’s relationships with things — shape and style, function, cognitive and physical interactions, as well as culture — if design is to attend to human needs and desires. And account needs to be taken of the past. The methods and theories of cognitive science, social psychology, and ethnography are now regularly used in design thinking and practice to offer insight into human needs and desires. But what of the past? What of history, tradition and cultural memory? Most designers accept that there can be no “clean slate”, that design cannot wipe the past clean to start fresh (and attempts to do so always fail). Memory is a fundamental human attitude towards things — the past is all around us, embodied in material things and places. Who would doubt that memory, tradition and our relationships with the past, as well as the present and future, are not at the heart of our relationships with goods? How might we mobilize this temporal nature of things in order to inform design? This seminar explores antiquarian practice as a paradigm for making design thinking and practice more sensitive to the temporal nature of human relationships with things, as well as using a design orientation as a means of generating insight into antiquarian practice and the cascade of research fields that followed the dispersal of antiquarian practice into disciplinary specialties. Weekly sessions will lay out brief histories of antiquarianism and design thinking and then trace in parallel a set of key, shared principles of antiquarian / design practice. The seminar is shared with members of Bard Graduate Center in Manhattan (a center of expertise in design history) and will involve guests from the design world as well as the academy.